If you want to learn how the world’s most successful people transform failure and adversity into BIG success, this is the book for you. What the seven stage process all business people go through after making a mistake. How to transform even your biggest failures into your greatest success yet. What the most common business mistakes and failures are & how you can avoid them. The secret ingredient that separates successful business people from those who wish they were. How 163 of The World’s Greatest Entrepreneurs Transform Failure & Adversity Into Success! Entrepreneurs & Founders: Showing you step-by-step how experienced business owners overcome failure & build thriving brands on the back of this. Writers, Bloggers, Podcasters & Artists: Helping you not only build & nurture an invested audience, but how to leverage your mistakes so you turn them into your biggest endorsers yet. Online Coaches & Consultants: Not only giving you the tools and know-how to improve your own business, but to help your clients thrive better than ever. STILL UNSURE IF THIS IS THE RIGHT BOOK FOR YOU? 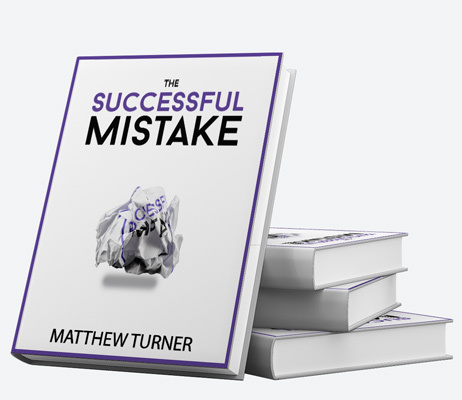 Matthew Turner is an author & storyteller who works with entrepreneurs, founders & creative thinkers build thriving businesses that light a fire within them. After interviewing 163 authority figures, Matthew’s unearthed how successful people overcome failure and adversity, not only ensuring they don’t end ruin their livelihood but form the basis of their greatest idea yet. Through his research & findings, he’s ready to share what separates successful business people apart from everyone else, and how you can implement a successful mindset that lets you build a happy, free & successful work / life balance — let alone profit & all the other goodness that comes with success & infamy. (2) start now, because failure is inevitable, so better get used to it and get good at rebounding.